A marketing professional experienced in different aspects of telecommunications, media and entertainment, Guilherme has a strong background in content distribution, music business and digital marketing. At Som Livre, he is responsible for all areas of digital marketing initiatives – communication, digital sales and e-commerce. He also leads the international department and looks for opportunities to foster Som Livre’s music abroad. In his previous role as Label Coordinator, Guilherme was planning the marketing activities for the company’s boutique label “slap musica”. He started his professional career as an Art Department Intern at Unlike after his return from an international experience program at Disney Orlando. In 2005, he joined Som Livre, where he spent the next three years before taking a traineeship with Brasil Telecom, focusing on Internet, 3G and Data offers for the B2B segment. 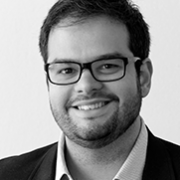 After Brasil Telecom’s acquisition by Oi in 2009, Guilherme became Senior Marketing Analyst before re-joining Som Livre in early 2010. Guilherme holds a BA in Marketing from ESPM and an MBA from IBMEC Rio de Janeiro.